American rock band Eagles of Death Metal has announced the new dates of the European tour following last month’s Paris attacks. Eagles of Death Metal were playing a gig at the Bataclan concert hall when gunmen stormed the building killing 90 people on November 13. 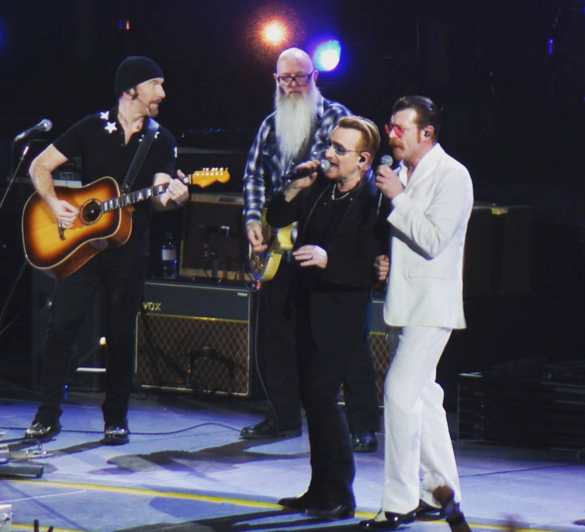 The band returned to Paris last week to play a song with U2 and will play the city’s Olympia Theater in February. Fans who were at the Bataclan show on November 13 will be entitled to a free ticket for the rescheduled date at the Olympia on February 16. The Bataclan concert hall will not be open again in time for the band’s return. In his statement, Jesse Hughes – who paid his respects outside the venue on his return to Paris earlier this month – said: “Our feeling of love towards this beautiful city and its people has been reinforced a million times over this past month. “Hearing the stories of the survivors, the injured and those who have lost loved ones has been overwhelming. Not returning to finish our set was never an option. EODM wrote on the band’s Facebook page: “We are proud to announce that our rescheduled European tour — now called ‘The Nos Amis Tour’ — will begin on February 13th. And we cannot wait to see your beautiful faces.